This work deals with the two fundamental units of sound art: space and time. It represents a work of quite minimal intervention, but I was surprised at how long I could sit and listen to it, hearing the slight variations and one sound entered and another gradually faded away. Around two weeks into the exhibition I was reading 'Begin Again' - a biography of John Cage and found to my delight (and suprise) that John Cage actually lived in Bank Street, Manhattan for a time. A happy coincidence. Given the resources I'd like to present a transatlantic version of the work, with the sounds of the two Bank Streets being passed over many miles. "The Ballad of Bank Street is a piece about moving sound in space and time. In using the outdoor sounds of Bank Street itself as its source I've taken a cue from John Cage who talked about not owning any recorded music, preferring to open his apartment window and listen to the traffic. By moving these sounds from outside on the street to inside the gallery they are abstracted from their source. This gives the opportunity to listen in a reduced way - a term coined by Pierre Schaeffer to describe audiences listening and enjoying sounds for their own sake, taken away from their source or supposed source. To further abstract the sound they are also moved in time. 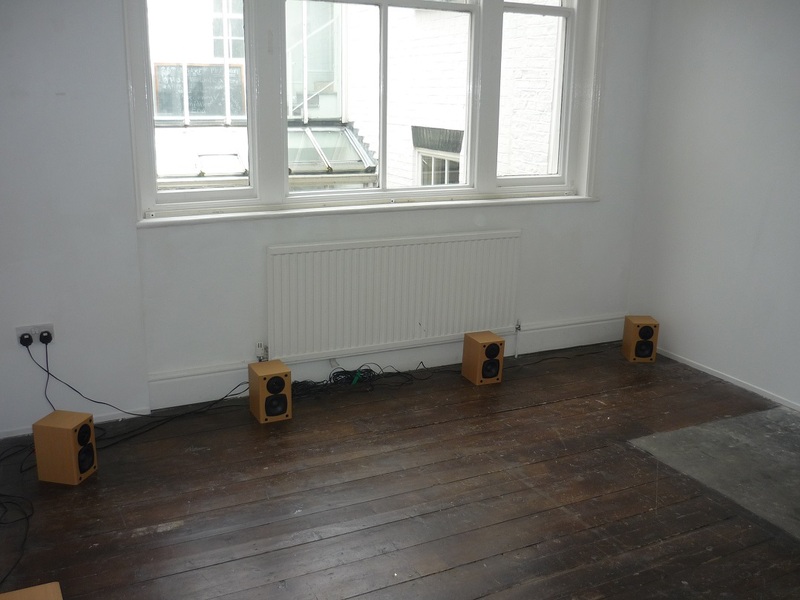 Each of the 8 speakers in the gallery is delayed from the previous. At any one time listeners are hearing a slowly decaying aggregation of the previous 8 minutes activity on Bank Street. Individual sound events coalesce to become a larger abstract sound mass. Through minimal intervention I hope to have created a slowly changing, meditative space where listeners can enjoy a different perspective on the everyday sounds of a street in Sheffield." The audio in this video is rather quiet, as it reflects the ambience of the installation itself (and the pickup of the mic on the camera). The audio files give a slightly more representative picture, although the 8-channel sound is reduced as they were recorded in stereo in the room.